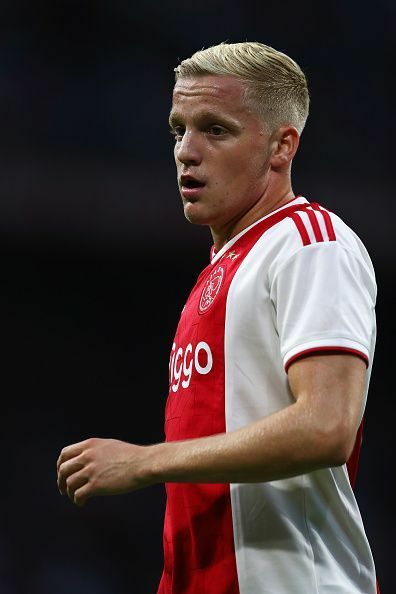 Donny van de Beek is a Dutch professional footballer who has played as a centre midfielder in the Netherlands junior national teams at different age levels and is currently a part of the senior squad. He has played for Veensche Boys and Jong Ajax in the Dutch Eerste Divisie during the course of his career. He currently plays for Amsterdam based club, AFC Ajax. Born on 18 April 1997 in Nijkerkerveen of province Gelderland in Netherland, Beek began his youth career by playing for a local club Veensche Boys. Few months later he switched to the youth setup of the popular club, Ajax. In the season 2014-15, Beek made his professional career debut for Jong Ajax - a reserve team of the core team of the club. He played in the Eerste Divisie in 6 games of the season and left a good impact on the selectors and coach by his sharp passing and shooting skills. He earned the title of Ajax Hottest Prospect in his opening season. In the following 2 seasons, he made a total of 29 appearances and scored 8 goals for the club. He soon cemented his place in the core team of the club and made 10 appearances in the 2015-16 season in Eredivisie. He played a total of 70 games for the club and had scored at 12 times. Beek was a part of the UEFA Europa League runners-up squad of AFC Ajax in season 2016-17. He was the part of the runners-up team of Netherland in UEFA European U17 Championship in his debut season. Donny started playing at the international level in 2013, for the U17 team of Netherlands. He went on to play for all the junior national teams of different age groups and was selected to the senior team in 2017 and has been a regular member of the team since then.